Located in the heart of the Loire Valley, in a peaceful village only 4 km from Tours, Loire Valley Medieval Getaway is a historic property with 12th century walls offering independent lofts and rooms. With a natural setting, it includes a flowered garden. All accommodations combine authentic decor with modern comfort and have an independent access, a flat-screen TV and free WiFi. They also have private bathrooms with a walk-in shower and free toiletries. 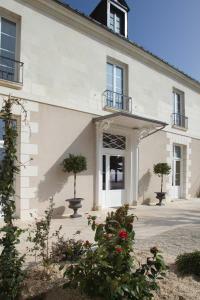 The Chateaux of the Loire Valley are within 10 to 50 minutes by car from the property. Tours Train Station is a 11-minute drive from Loire Valley Medieval Getaway, while Tours Val de Loire Airport is a 10-minute drive away. A free parking is available. When would you like to stay at Loire Valley Medieval Getaway ? This apartment features a washing machine and a seating area and an equipped kitchen. This double room features a private entrance. Guests have access to tea/coffee facilities. This villa has a balcony, tile/marble floor and a fully equipped kitchen with a dishwasher. This cottage features a fully equipped kitchen with a dishwasher. Please inform Loire Valley Medieval Getaway in advance of your expected arrival time. You can use the Special Requests box when booking, or contact the property directly with the contact details provided in your confirmation. Guests are required to show a photo identification and credit card upon check-in. Please note that all Special Requests are subject to availability and additional charges may apply. The property will contact you a few days before arrival with information about check-in and the exact address. Please note that the extra bed and the baby cot can be added at an additional cost when there are more than 4 guests. Each day we'll check prices and send you an email for your selected dates at Loire Valley Medieval Getaway. If you don't have specific dates but would like to check prices for say next weekend or say next month we can check the price too. Click to write a review and share your experience of Loire Valley Medieval Getaway with other travellers.